What is a Delaware Last Will and Testament? 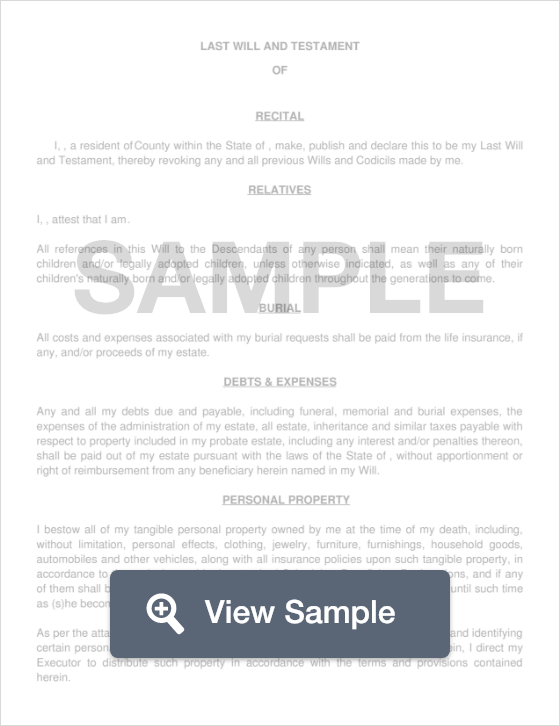 Delaware Last Will and Testament: What Is It? In the state of Delaware, a Last Will and Testament is a legal document created by the a person, known as the Testator, that ensures that his or her wishes are followed when it comes to their assets after they pass away. A Last Will ensures that the Testator’s assets aren’t claimed by the state, but rather transferred to the person or people of the Testator’s choice. In Delaware, this document must be signed by the Testator, two witnesses, and notarized by a Notary Public. Furthermore, the Testator may register the Will with the County Clerk's office for further protection and validity. Below are the defined signing and witnessing laws in regards to Living Will documents for the state of Delaware. Witnesses - According to DE Title 12, Chapter 2, Section 201-202, the Will must be signed by two (2) witnesses, or by a notary public or another individual authorized by law. Register of Wills - Grantors may register their Will at the following locations: Kent County, New Castle County, and Sussex County. Using the attached FormSwift Last Will Template, start by filling out the following information. In addition, state the name of the Testator’s spouse (if applicable). Pets - Pet Name, Species, etc. Property - Property Details, Address, etc. Step 6 - Provide the name of anyone who the Testator wishes to set up a trust for who is disabled or requires specific care. Setting up a trust for this person can prevent any eligibility hiccups from them receiving Supplemental Security Income or Medicaid benefits. Step 9 - Provide ay specifications the Testator may have about the last meal after the funeral service. Step 10 - Naming an Executor - Provide the following information about the appointed Executor. Step 13 - Guardian for Minor Children - If the Testator has minor children and wishes to appoint a Guardian, please state the following information. Remember to have this document witnessed and notarized for it to be legal. This document can also be submitted to the County Clerk's office for further validity.